PVC banners for Mobile Billboards offer the benefit of being reused time after time. Banners are guaranteed for life while being exclusively used on Gorilla vehicles. Production of reusable 48-sheet 20ft x 10ft AdVan PVC banners printed in full colour and high-resolution (suitable to reproduce photographs) from artwork supplied: £600 per pair. 96-sheet 40ft x 10ft AdTrailer: £1,200 per pair. PVC flashes can be used to add impact and minimise production costs. Typically flashes are used for date critical events i.e. “Opening Soon” removing flash to reveal “Now Open” or for specific store details – address, dates etc., Flashes can be up to 25% of the banner area and cost £150 per pair on a 48-sheet and £300 per pair for 96-sheet displays. 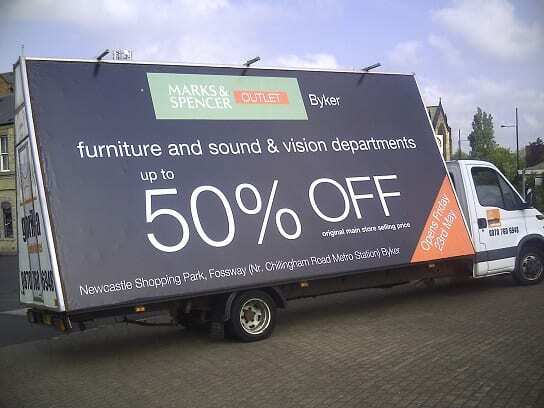 Production prices for mobile billboard banners include fitting and storage between campaigns as well as environmentally friendly disposal at the end of their useful life.